Home › Energy-Efficient LED Lighting › Mpow Super Bright Solar Lights Weatherproof 20 Led Outdoor Motion Sensor Ligh.. Style: 2-Pack Brighten Your Way Home! 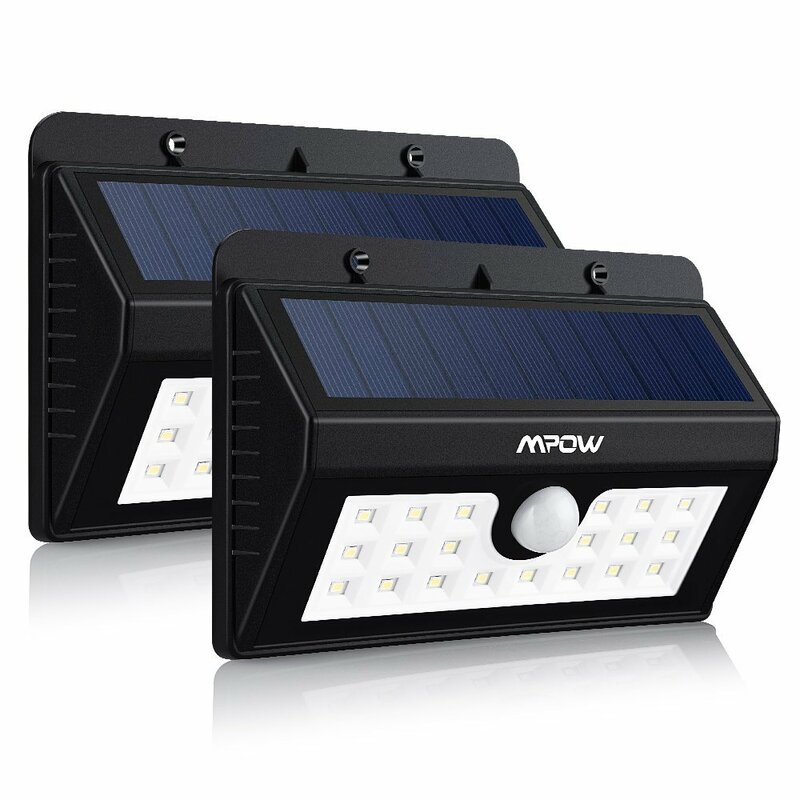 Smarter Sensor Modes Mpow Solar Motion Sensor Light now has Three Intelligent Modes for yourchoice. 1.Strong Long Light Mode: When it fades into darkness, the light will keepstrong and bright until the environment becomes bright. 2.Dim Light Sensor Mode: When in dark night, the light will be dim withoutpeople coming near. If people comes, it will brighten up, and the bright lightwill last 15 seconds until it returns to dim light again. 3.Strong Light Sensor Mode: In night, the light will be strong bright whenpeople comes, and then 15 seconds later, the light dies out automatically. Brighter Lights Last Longer This Mpow light is now equipped with 20 bigger LED lights, which is far morebrighter than other similar LED lights in the market. And what's more, weincrease the battery capacity from 600mAh to 1500mAh, thus getting some twomore hours' duration. Better Sensor Ballhead When received this Mpow Solar LED Light, you will find distinct differencecompared to its previous version or similar lights in the market, We updatethe PIR motion sensor and ray sensor, so it becomes more powerful that it candetect people's coming within 26 feet! Phenomenal Overall Quality To improve the waterproof level, we now add two layers, tightly sealed innerloop to its back case, hence, this Mpow light becomes more durable andweatherproof. And we have also updated the solar panel, thus getting a high-efficient, frosted, anti-scratch solar panel.